Scary Terry's World: The Batman Strikes... out! It seems odd to be writing this post. I just got my copies of The Batman Strikes #50 -- the final issue of that series. Above is the art for the cover (though a version I found on the web with coloring I actually prefer to the version that was published -- I'm just not a fan of a lot of the modern color effects being used today -- give me flat traditional comic book color any day). Anyhow --For eleven years I've been inking the animated style Batman titles for DC Comics -- and, for now at least, I'm done. 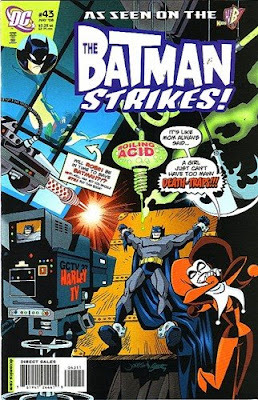 The animated series upon which The Batman Strikes was based has run its course -- and the comic book has followed suit. There's a new Batman cartoon in the works -- and there will be a comic book version. Whether I'll be working on that, only time will tell. So, lets' take a walk down memory lane, shall we. Here are some of my favorite covers/issues of the various Bat-books. 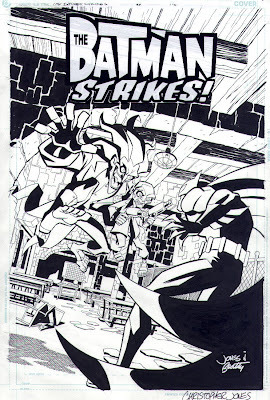 Chris Jones and I only got to draw a handful of covers for The Batman Strikes -- but for my money, they're the best ones the series had. here's a quartet of them -- some in B&W, shot from the original art, others showing the printed color. 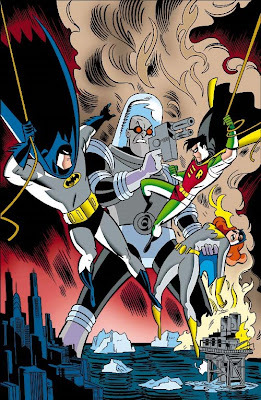 Batman and Robin Adventures #18 was the first issue of my long run on Batman. 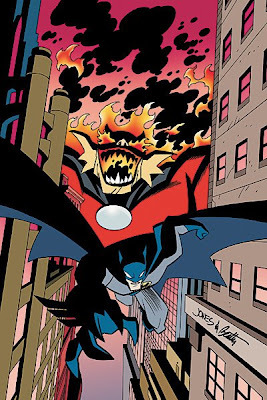 I'd been hired to fill in for inker Rick Burchett, who was taking a break to draw the first half-dozen issues of Superman Adventures. When Rick returned, he did so as penciller, and I stayed on as inker. 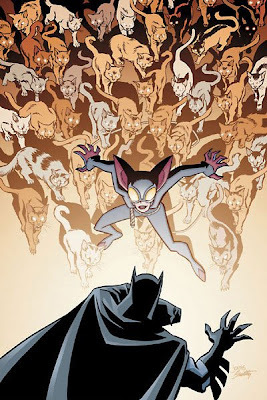 The cover of #18 is by the ever-wonderful Ty Templeton. 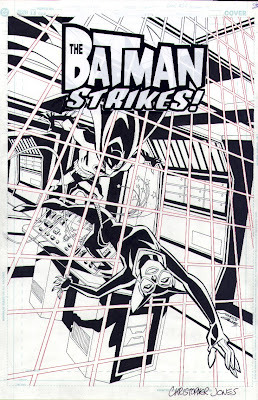 One of my favorite cartoonists, Joe Staton, pencilled a number of issues of the Bat-comics -- and I always enjoy inking Joe's pencils. Here's the cover of our adaptation of the animated film Sub-Zero, minus any distracting cover copy. This got reused for a freebie mini-comic in packages of microwave popcorn. How odd it was to walk into a grocery store and see this image on the popcorn box! 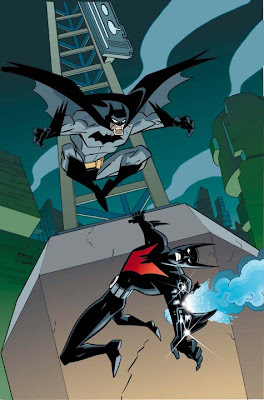 Bob Smith and I collaborated on many covers for both Gotham Adventures and Batman Beyond. This is my favorite of our cover images. Another great Bob Smith pencil job. 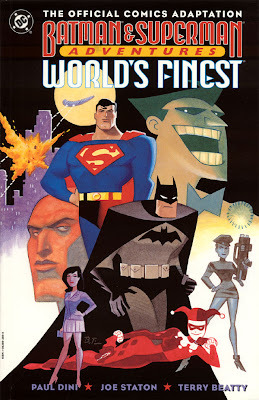 This for Batman Beyond -- a series I particularly enjoyed. I may be digging into my files and posting some more Batman images if you'd like to see them (let me know). I had a great run on these titles and got to work with some really talented, wonderful writers, artists and editors. I won't try listing them all here, as I'm sure I'll miss someone -- but I want all my collaborators to know that I sure enjoyed the ride and would enjoy working with any of them again. definitely. 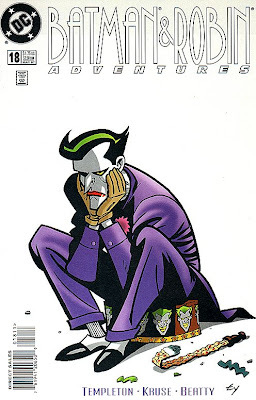 I would request stuff from Gotham Knights #1 -- I was looking through that Batman: Animated book and noticed the cover, seeing that you inked it -- I LOVED that comic in sixth grade! 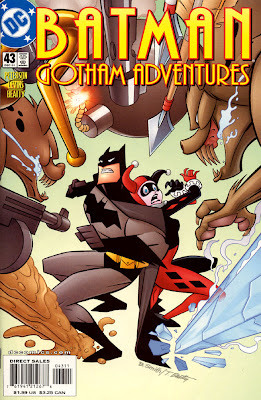 Are you thinking of "Gotham Adventures?" "Gotham Knights" was a rejected title for that series. While I inked the interior of #1, the cover is 100% Ty Templeton. What a great retrospective...I hope you're on for the Brave and the Bold adaptation!